We’ll explore the subject of “old time” Madison bands and musicians, including Schenks’ Corners own Larry Borenstein. We’ll view scenes from a recorded interview with saxophonist Larry Borenstein and hear from other guests involved in the Madison music scene. We’ll meet Saturday March 20th 2–4pm, at the Goodman Community Center, 149 Waubesa St. $2 suggested donation. 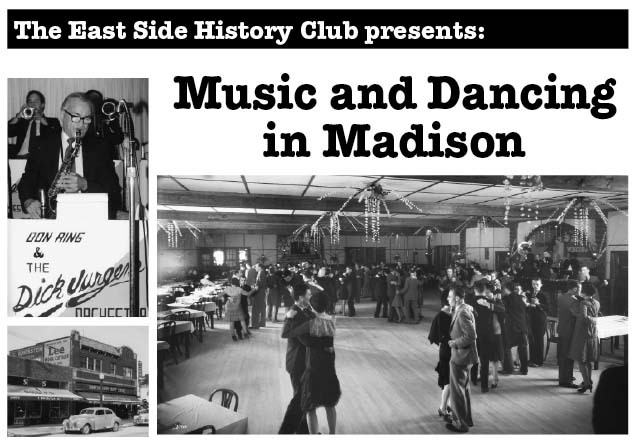 Come prepared to share your memories of bands, musicians, and places where you danced! Photos: Larry Borenstein with his sax courtesy of Kim “Dr. Sax” Slava. Borenstein’s at Schenk’s Corners courtesy of Jan Foss. Chanticleer ballroom (WHI-60685) courtesy of Wisconsin Historical Society. This entry was posted on March 9, 2010 at 2:43 pm	and is filed under Uncategorized. You can follow any responses to this entry through the RSS 2.0 feed. You can leave a response, or trackback from your own site.